Drop everything and set off on an adventure at the other side of the world… lots of people dream about it, but few take the leap. Such a desire for freedom and the exotic seems even less achievable with children. And yet the three families we followed took up this crazy challenge. In this next episode, the adventurers takes us along on their journeys, with all their moments of struggle and excitement… to the four corners of the globe. Emily and Daniel sold their house in the Lozère and quit their jobs to travel Europe… on bikes! In addition to sixty kilos of luggage each, they are carrying their two children: Soline, 3, and Hugo, 7. After crossing the south of France, Italy and Croatia, the family will be savouring the hospitality of the Montenegrins. A welcome that brings warmth to their hearts… especially as they still have 1000km to cycle before they reach the Greek islands, their final destination. This unusual physical challenge finally mars the couple’s good relations: “You may think it’s all roses simply because we’re no longer in the daily routine, but where the couple is concerned, it’s like at home, there are always some little points of friction”. The hitchhiking adventure undertaken by Jeremy, landscape gardener, and Sophie, nurse, was interrupted by three-year-old Eliott’s appendicitis. 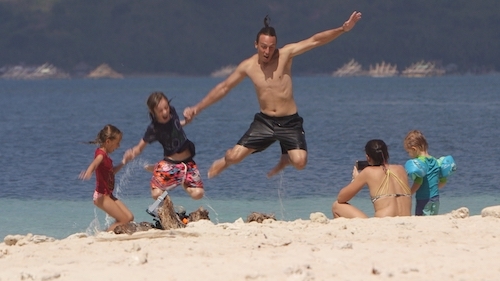 Still in Indonesia, Jeremy finds himself solely responsible for his two older children. They hit the road again and experience an unforgettable moment atop the Bromo volcano, which is still active. “Of course, I’m thinking about my wife and my son, we would have loved for them to be with us”.And then there’s the moment of reunion. And the journey resumes the Rock’n’Roll rhythm of a large family… How will the couple deal with their final ordeal: the return to France? On bikes, or by hitchhiking, these families decided to take the time to travel the world. But there’s another possible vision of adventure.